A woman has been airlifted to hospital following a crash involving two vehicles and a horse. 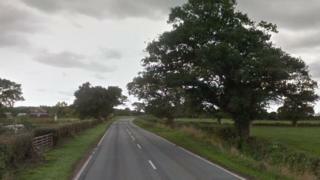 Ambulance crews from Wales and the West Midlands went to the scene outside a farm on Long Lane, Bronington, near Wrexham, at about 19:30 GMT on Tuesday. West Midlands Ambulance Service said the woman, who was a passenger in a car, was airlifted to Royal Stoke University Hospital. The woman has critical injuries, and the horse died at the scene. A man was also treated at the scene. North Wales Police said the collision involved a BMW X3 and a Daihatsu Sirion, and are appealing for information.